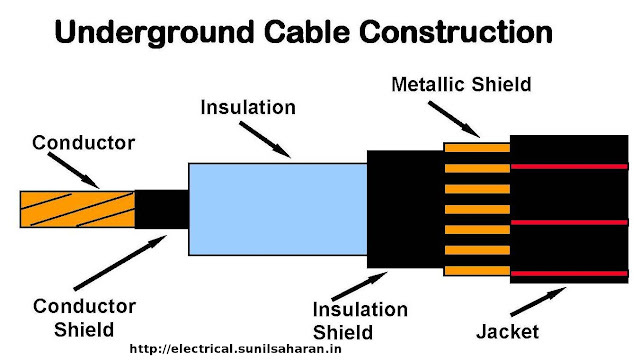 This article explain basic terms associated with underground cable and construction of underground cable. Electrical systems are based on electrical energy and there are two main ways to transfer electric energy from one place to another place viz. We may compare these systems in other post but our current discussion is based on underground cables and their types. Cable : A cable is nothing more than a medium to transfer electrical energy from one place to another place or we can say that a cable is just an insulated conductor which connects supply point and load point for operation of an electric equipment. Underground Cable : A cable so prepared that it can withstand pressure and can be installed below the ground level and normally two or more conductors are placed in an underground cable with separate insulation on each conductor. Above image shows the parts of an underground cable. Here is a little description about the parts of an underground cable : Conductor or Core : Conductor or Core is the main part of the underground cable. It is a conducting material generally made up of Copper, Aluminium or ACSR depending on many factors like Voltage rating, power to be handled, distance between service and load point. Shield : Shield or conductor shield is also a conducting material and its purpose is to protect the conductor against crack or discontinuity. Insulation : Each core is provided with individual insulation and the purpose of this insulation is to separate the conductor from the other part or other conductors. Sheath : Sheath is a metallic layer provided over the insulation of the core or the conductor. Filler :Filler materials are used where two or more conductors are there in the cable. The space between various sheath is covered or filled with the insulating material and thus the name filler comes. Bedding :Bedding is the insulating layer that binds the filler material and it holds all cores of the cable. Armour :Armour is a galvanised steel layer for providing mechanical strength to the cable. Serving : Serving is an insulating layer that protects the cable from corrosion and other chemical reactions with soil. It prevents moisture being entered in the cable.